Net Promoter Score® (NPS®) is usually correlated with a business’ growth potential – and for good reason. However, it’s important to understand that there’s more to an NPS campaign than the score itself. There are various aspects of the NPS data that will help you collect in-depth customer insights which are usually easy to miss, but nevertheless, crucial for an effective NPS campaign. The only issue with that is that it can be difficult to interpret the data – especially if you’ve never done it before. Don’t worry, though – we’ve got you covered with useful tips on how to analyze the survey data from your NPS campaigns. If your score is higher than 70, congratulations! Most of your clients are brand advocates. 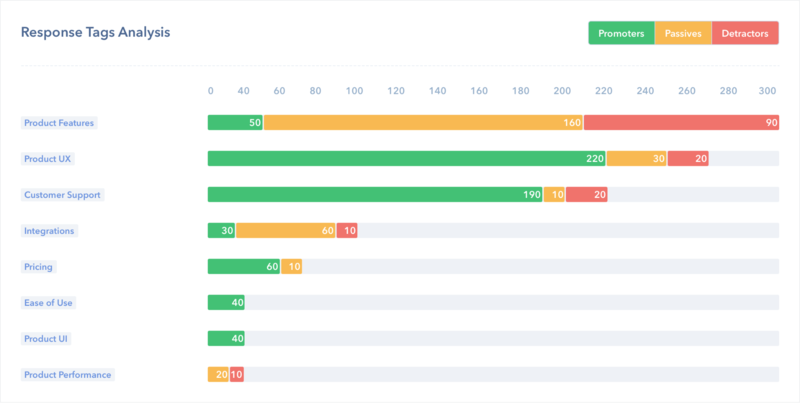 Just keep in mind – the score itself is quite volatile and can vary a lot depending on how many clients you have, and how many of them actually respond to the survey. Basically, we’re referring to the total distribution of Promoters, Passives, and Detractors. This is something that comes in handy if you have multiple business locations you need to keep track of. For instance, say you have 2 stores with the exact same NPS score of 33. That info alone is not enough to make a clear decision on how you would work the customer experience in the future. Why? Because there’s always a chance that store A has a larger number of Promoters than store B, while store B has a larger number of Passives and a lower number of Detractors than store A. Considering this, you’re going to need a different approach for each store. When it comes to client distribution, especially in B2B, a different approach would be to also consider the role of those who respond to your surveys. For example, you could find out that your product is quite popular with middle management while executives don’t interact with it. Make sure you are surveying the right people and get the maximum out of your voice of the customer program. All channels have their specific pros and cons. However, if you are a small business on a tight budget, you can’t really afford to focus on all of them to see which one is the most appropriate for your audience. Luckily, a thorough NPS survey analysis can showcase which channels work best with certain types of clients. Let’s face it – depending on a customer’s position in a company, age or standing in life, they would be more likely to interact with a channel that resonates with their lifestyle. This type of segmentation can be very useful, as NPS surveys can be automated to ensure they are sent to clients only through the communication means that interest them, thus increasing response rates significantly. Some NPS products will display the preferred survey channels for a particular segment of customers. Advanced services, though, will give you the ability to set a preferred channel to a customer, or audience segment, and give that channel a higher priority when sending surveys automatically. Survey delivery reports provide great insight into this matter, most important metrics to consider being the survey response and survey score rates. Essentially, you need to find out which clients engage with your NPS surveys the most – who is more likely to answer your question(s) and leave feedback, and how often they do it. This way, you can identify the exact customers who are more likely to offer actionable feedback. Your Customer Success team can reach out, and do their best to convert these customers into brand advocates. Basically, you need to check your survey delivery stats per customer and find their response rate. Target customers with the highest response rate, since they are most engaged with your surveys. But this goes the other way around as well. It is also highly recommended to identify clients with a low response rate and try to understand what’s stopping them from engaging with your NPS survey. If you survey customers on multiple channels, such as email and in-app (web), you might want to consider looking into the survey delivery stats for individual customers. Find out which are the most answered surveys by a specific client, or on the contrary – that have been ignored. This will help you understand what is the customer’s preferred survey channel. Make sure you continue your communication on channels that they are most comfortable with. Also, don’t forget to cross-check the NPS survey results with other important business intelligence data you have, such as how clients engage with your product(s) or marketing campaigns. Something as simple as that can help you acquire new insights on how you need to improve your product or service (or if you need to improve at all), and how you can adjust your marketing messages and branding to better resonate with your target audience. If you’re not very familiar with customer sentiment analysis, think of it as an information processing method that can be used to determine customer opinions based on the sentiment (positive, negative, neutral) associated with their comments. This method can help you learn whether or not clients were happy with a new product/service/feature, find quick solutions to customer issues, and even understand emerging trends. You can gain proper sentiment analysis from survey responses (which is why we recommend doing it when analyzing NPS survey data), customer reviews and social media interactions. Analyzing response sentiment is a good way to identify potential issues or biased NPS data. It will also help you prioritize feedback since a Promoter with negative feedback deserves your immediate attention, and if you act in a timely manner, you can avoid losing a potential long-term customer. There is nothing more powerful than getting to see your brand through the eyes of your customers. However, if you receive thousands of NPS responses, sorting through the received feedback becomes challenging since there is too much feedback to analyze manually, no consistent criteria to rely on and lack of granularity involved. Fortunately, there are several automated text analysis solutions, like MonkeyLearn or Thematic, enabling you to process high volumes of NPS responses automatically, and ensure consistent tagging criteria, round the clock. Text analytics applied to NPS responses can help identify common customer pain points by grouping feedback into theme buckets (tags), allowing you to understand how to improve. You would be able to group the Promoters, Passives, and Detractors, and find the most prevalent tags in their responses. The variety of data received following this survey text analysis is an incredible opportunity to take action and convert weaknesses into strengths. Businesses which are keen on building long-lasting customer relationships are increasingly turning to customer satisfaction surveys to measure and improve their customer experience. NPS surveys can help you gain a lot of helpful insights regarding how your customers really feel about your brand. But solely gathering customer responses is not sufficient; understanding and responding to the collected feedback is crucial. Once the weak processes are identified, businesses must close the loop with an immediate response to ensure the unpleasant situation is traded for a positive experience. Also, you should share all information acquired during the NPS data analysis across relevant departments in your company. Ideally, everyone should know exactly what your clients think about your services and/or products – from people involved in product development and customer support to those handling your marketing campaigns. Some NPS services give you the option to involve your colleagues directly in the NPS process, by giving them access to your campaigns. You can turn customer feedback into assignments or follow-up reminders for your colleagues and track progress without having to leave the platform. You already know that NPS can provide you with accurate data regarding customer satisfaction, but did you know you can segment it up to a specific customer lifecycle stage? Essentially, we’re talking about seeing what the average level of satisfaction among your customers is up until a certain stage, and using that info to better tailor and personalize your further customer satisfaction campaigns. Once you have enough customer data, you can start setting up campaigns for each stage and even automate the process to a certain extent. You should also use this type of info to better customize your survey template by personalizing the NPS rating and open-ended questions so that they resonate with each stage. For example, once you better understand your Passives, you could set an NPS survey to trigger whenever a specific event occurs. Send an NPS survey at each stage of a customer’s lifecycle to see how satisfied they are with using your product, learn how you can improve their experience, and what are the stages that represent the highest churn risk. Just imagine it – if you could find out which one of your web pages your Promoters visit the most, you could place actionable CTAs on it to drive even more engagement from them. The same logic could be applied to Detractors or Passives, as you could place a well-timed pop-up message giving them a discount or a sneak peek of an upcoming feature. Also, finding out what most of your Detractors and/or Passives have in common in terms of online behavior could help you reduce customer churn by taking the appropriate measures too. Importing your customers’ data to your NPS service will help you identify patterns in how Detractors, Promoters or Passives use your product. This will help you spot unhappy customers before they churn, allowing you to get in touch with them and learn how you can improve their experience. The businesses are constantly dealing with data; however, raw data is not insightful if not neatly organized. The challenge is to figure it out how the collected information can address existing issues and make the business visible. All the survey analysis data we discussed up until now can offer you a lot of insights into how your customers think, but there’s just one problem: getting access to all of that info at a time can be quite hard – unless you use a specialized NPS service like Retently, that is. With Retently, you can easily run NPS campaigns through multiple channels, customize the templates to make them more engaging, and get all the post-campaign data you need – all in one place. What is the Best Channel for your NPS Surveys - Email, Text or In-app?